The portable leather sharpening kit rolled up. 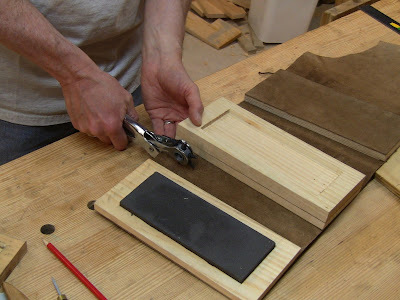 Here I'll show how to make the portable leather sharpening kit. Leather is a good material for this because it's tough, flexible, easy to work with, and stiff enough to keep things steady on the bench in use. The leather I used is from a half-side piece of Blacksmith side from Crazy Crow Trading Post. 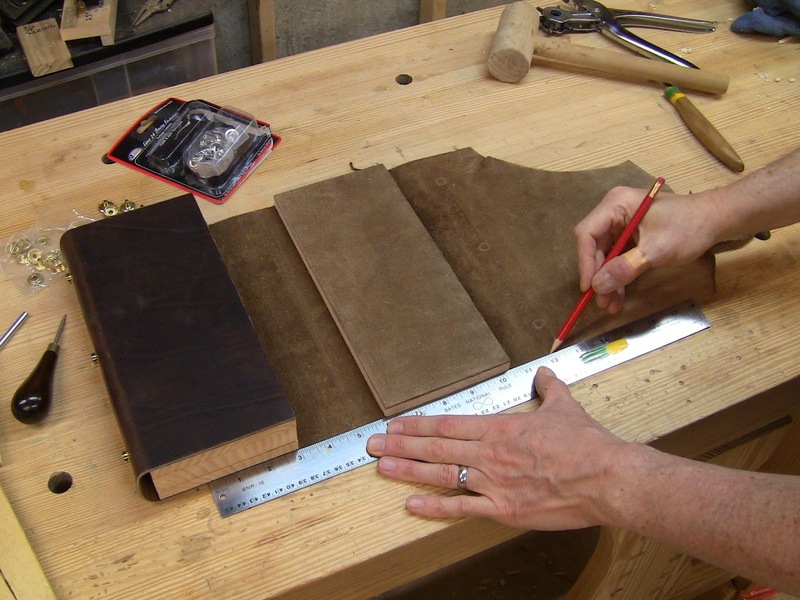 I also make my strops from this leather. 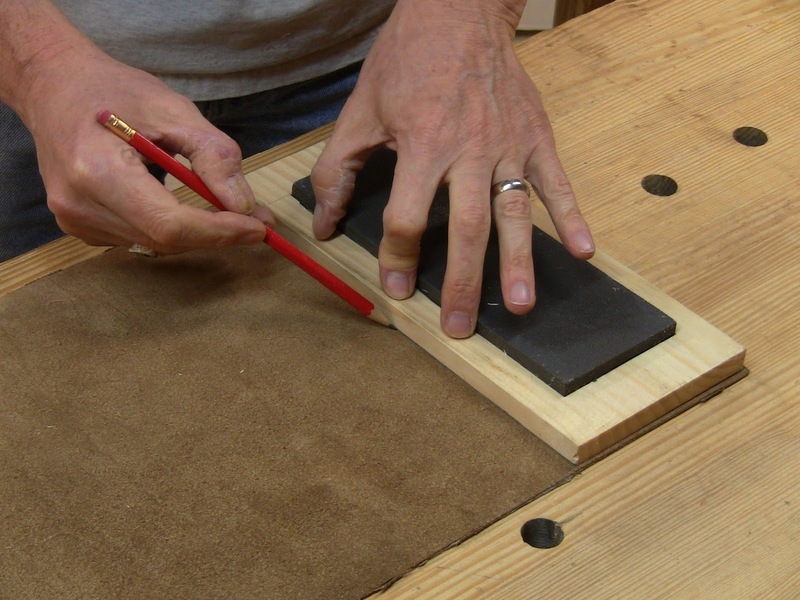 The kit unrolled, showing coarse and fine India stones and strop. The stone holders are made from 3/4" pine, excavated from solid pieces. I selected stock that was effectively quartersawn. They have a 3/4" border on each side, and 1 1/8" on each end. For 8" x 3" India stones, that comes out to 10 1/4" x 4". 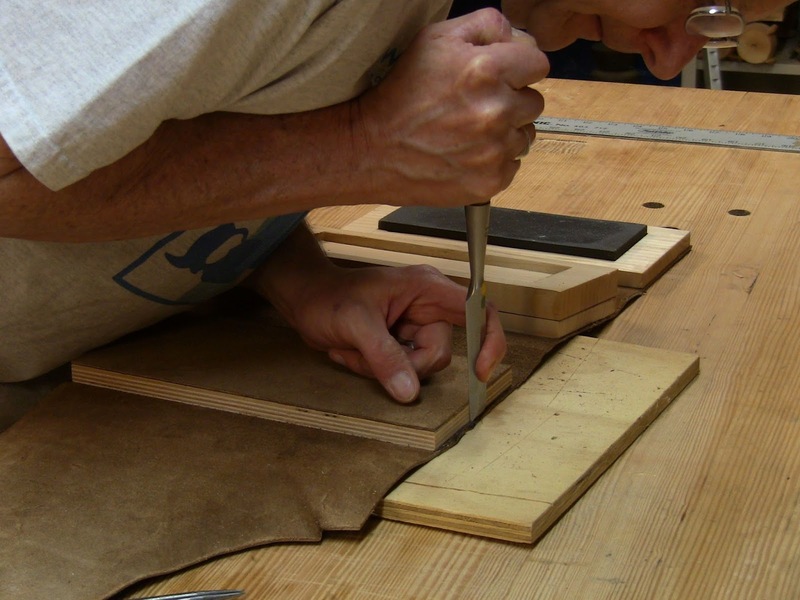 The strop is made from 1/2" plywood, sized to match. 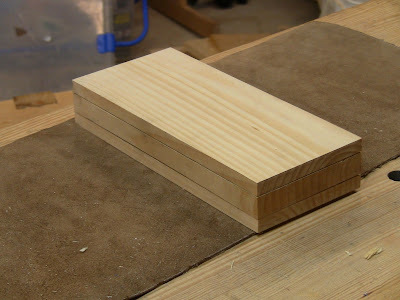 For the main holders, I planed the stock down to 1/2" thick. These stones are 1/2". I excavated 1/4" deep recesses in all the holders, so that leaves 1/4" of stone above the holder. The loose center holder is 3/4", with a recess on each side. 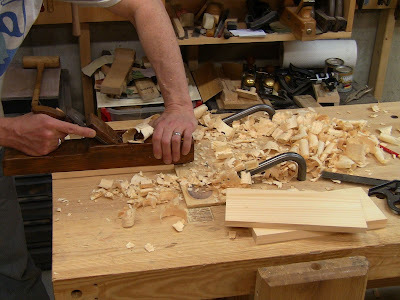 Roughing the main holders to thickness with a wooden jack plane. 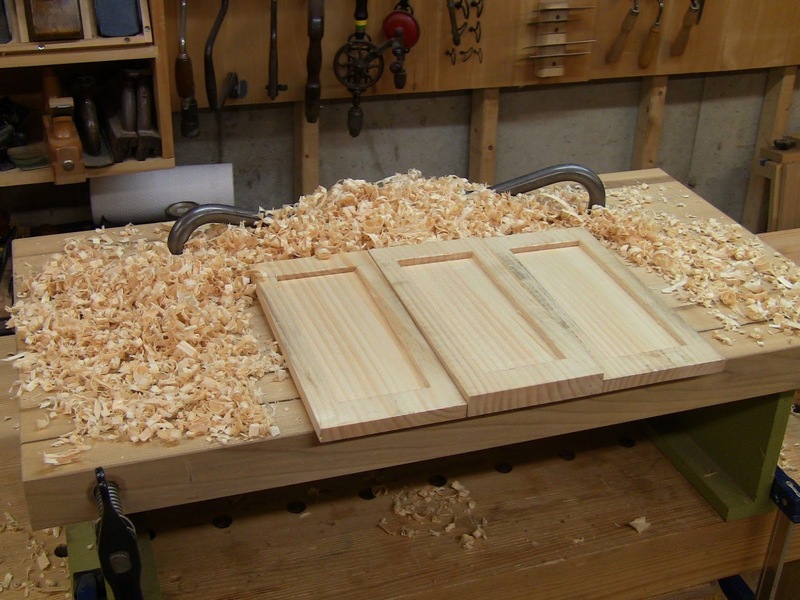 With the iron set for a heavy cut, this is about 30 seconds of work. Flattening them with a #7 jointer. I outlined the recesses with a marking gauge, then excavated them with a router plane. This might seem like a lot of work, but it goes easily in this pine. Just take it a layer at a time, don't try to hog it all out once. The quartersawn material excavates very nicely. 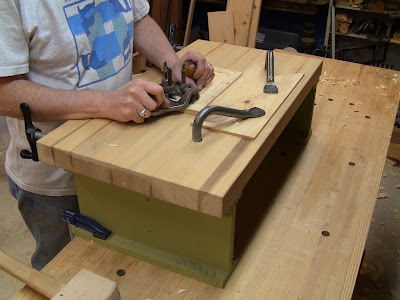 I did the work on my bench-on-bench to raise it up and save my back. This is much more comfortable standing upright. 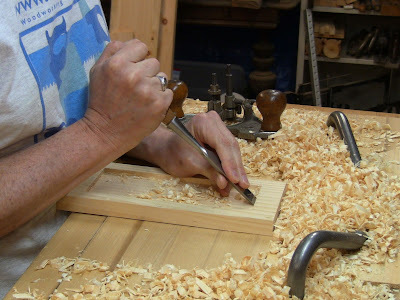 Excavating the recesses lengthwise with a router plane. Trimming up the end waste crossgrain. 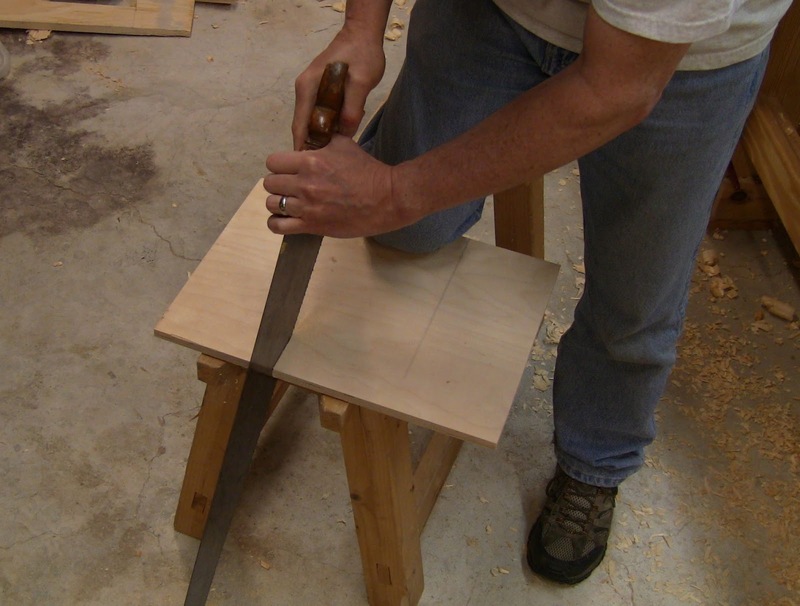 Chopping down the endgrain with a chisel to do the next layer. After excavating, cleaning up the edges. 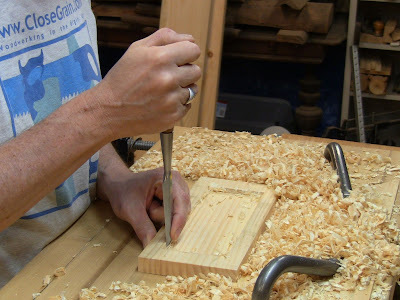 Be careful not to use too much pressure and split the piece along the grain. You want the stones to fit snugly. Make the excavation just a hair too tight, then enlarge it one shaving at a time. 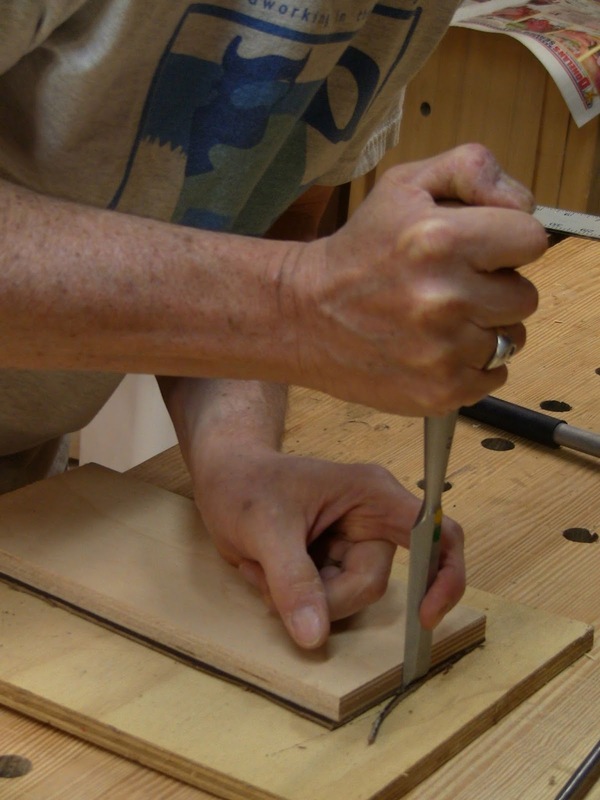 Cleaning out precise endgrain corners. Using a holder as a template to mark out the strop base. Sawing out the base. 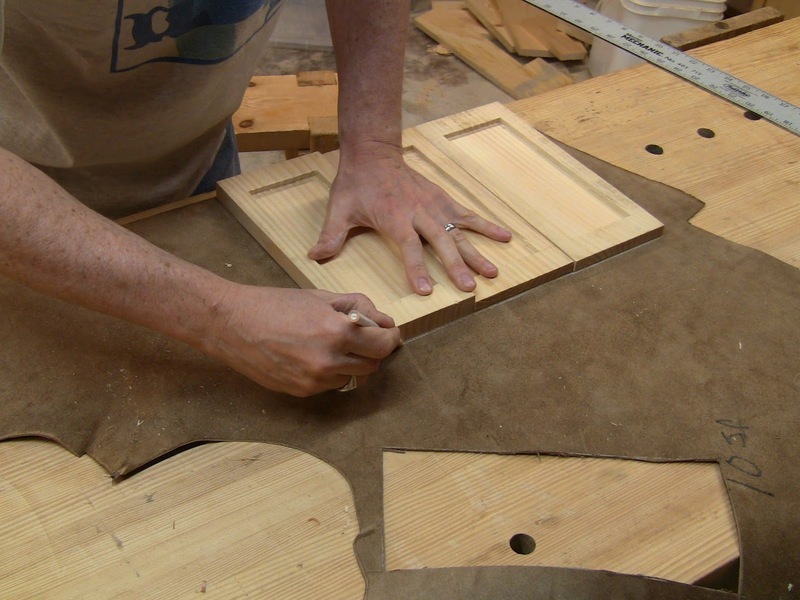 Plywood cuts easily with a crosscut saw. 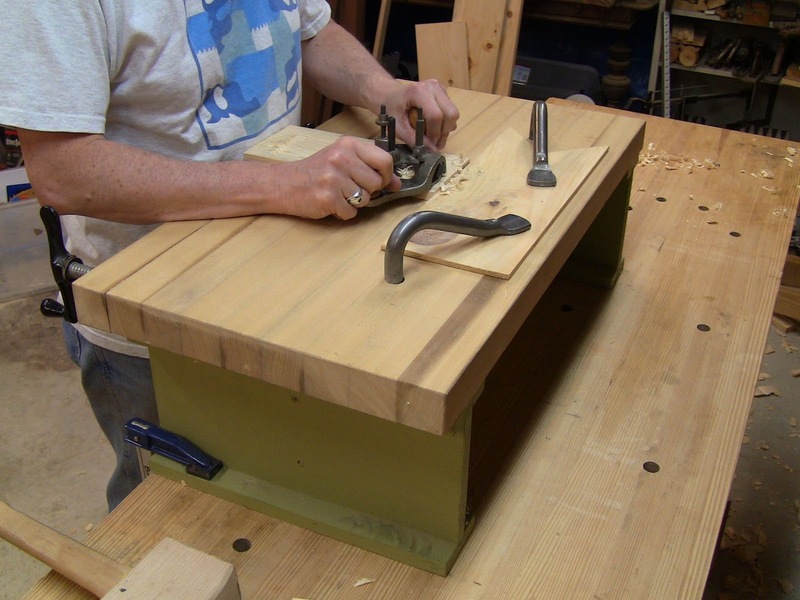 A ripsaw catches in the crossgrain plies and tears them. Shooting the plywood edges to clean them up. 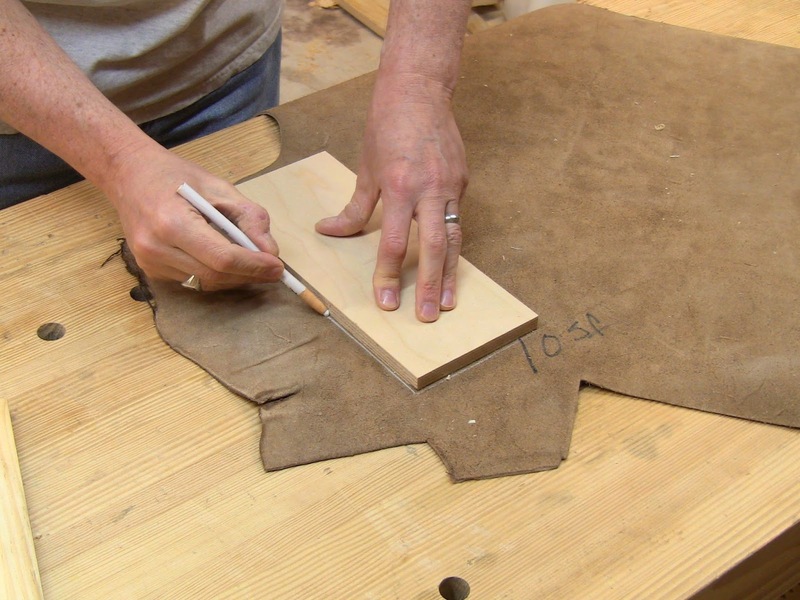 I did all the leather cutting with a chisel. 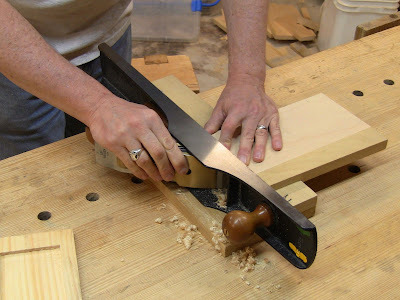 A sharp chisel slices it like a hot knife through butter. 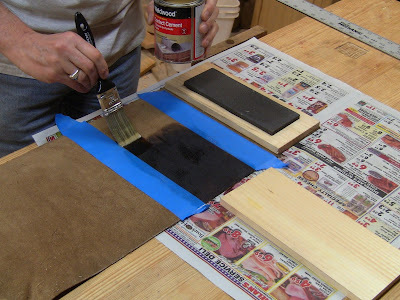 To glue the leather and wood, I used contact cement, then rolled it with a J-roller. The cement and roller are available from home centers in the laminate section. Using the strop base as a template to layout the strop leather with a white pencil. Using a chisel to slice out the leather, just a hair large. 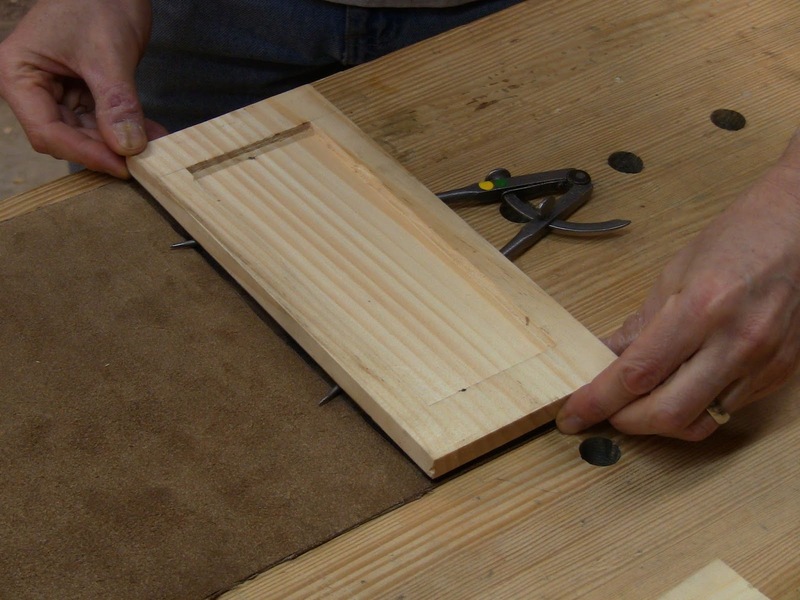 There's a scrap underneath as a cutting board. 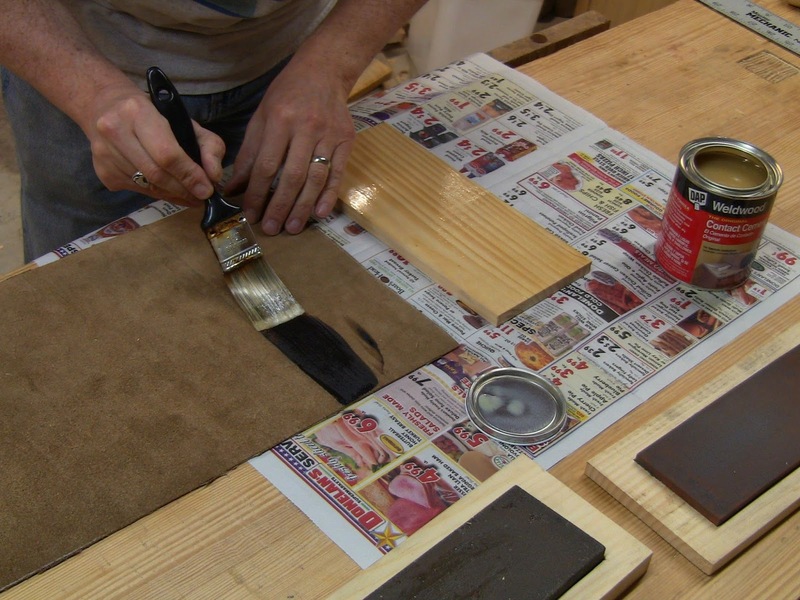 Brushing contact cement onto the leather and wood. This needs to dry for half an hour before putting them together. 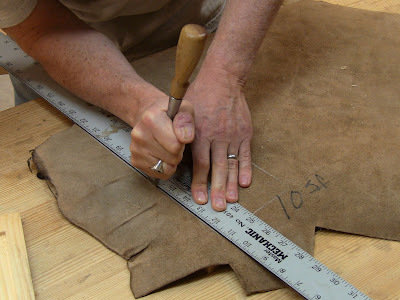 Lining things up to work out the general size of the leather. Marking out the side and upper and lower edges of the leather. Remember that there will be spaces between the wooden parts, so make it long. 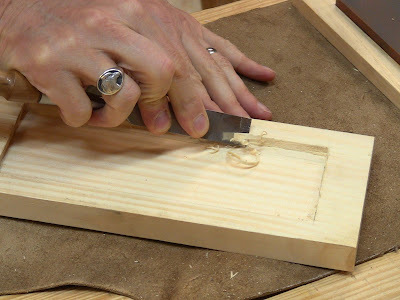 I cut it the same way with the chisel. Easing the edges of the center holder so that it fits over the stones easily when I close up the kit. The holders with the stones in place so I can figure out final spacing on the leather. 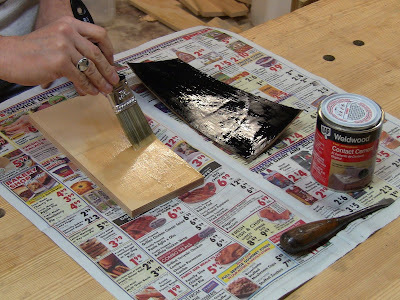 The contact cement is ready. 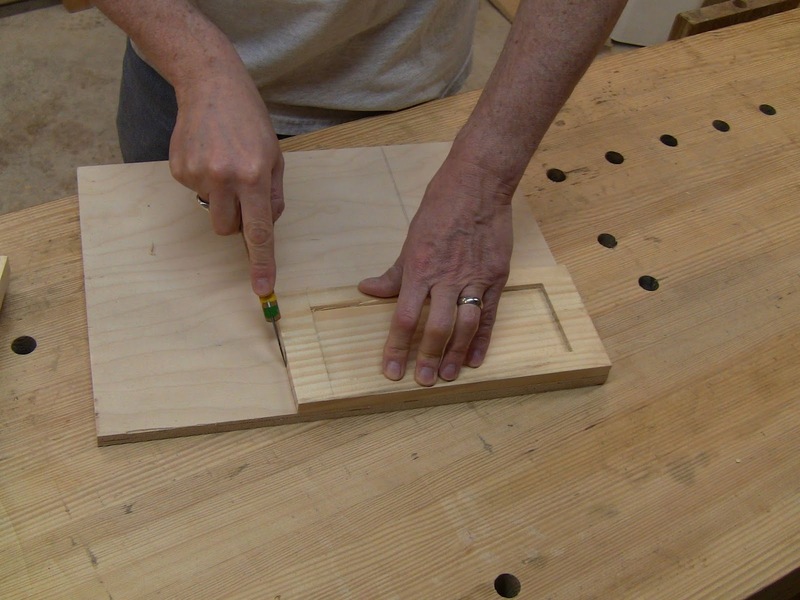 The dividers hold the pieces apart to allow me to position them precisely. Then I pressed one end in place, slid the dividers out, and pressed the rest down, stretching it as I went to avoid wrinkles. Applying even pressure all over with the J-roller. This needs to be flat, with no lumps. 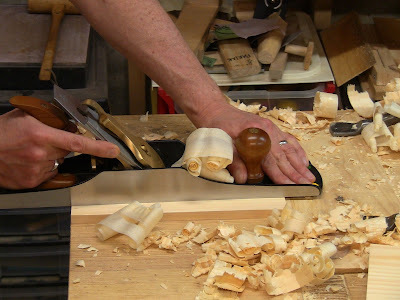 Trimming to precise fit. The chisel chops down through the leather easily with hand pressure. Lightly marking where the edge of the first holder will be. Brushing contact cement on the back of the holder and its position on the leather. 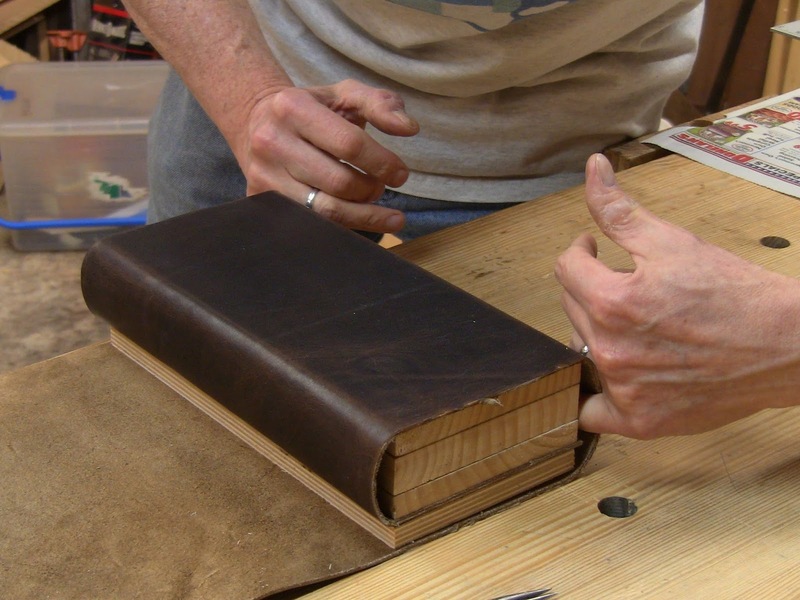 After letting it dry, positioning the holder on the leather. 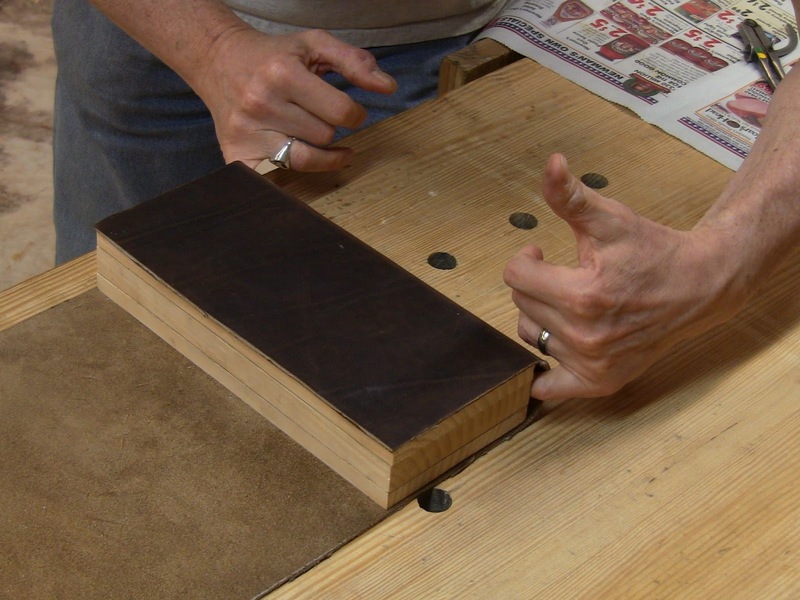 I pressed it and rolled it like the strop. With the first holder folded over in position on the stack, using my fingers to evenly space out the side. 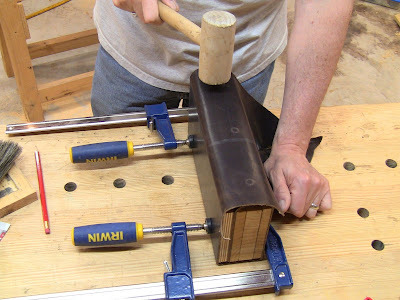 There needs to be enough slack that the center holder slides onto the stones as you roll it up. 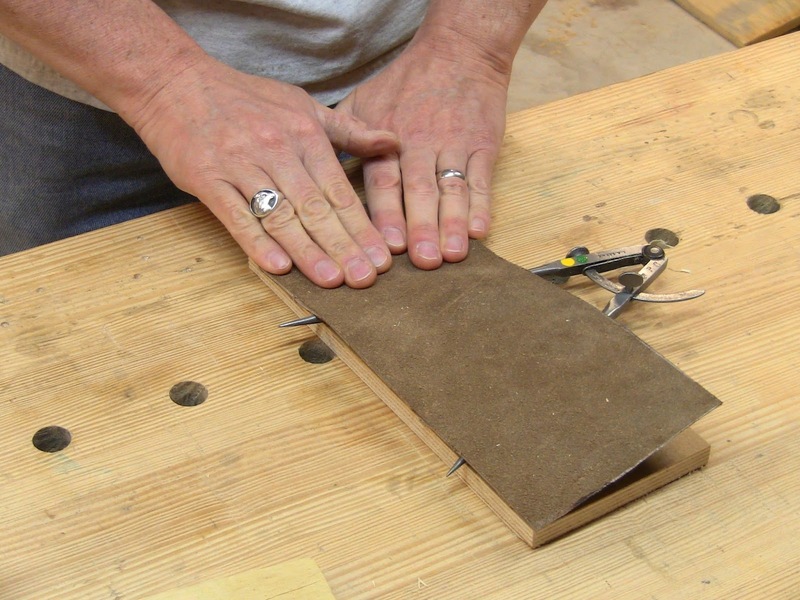 Don't make the corners tight. Brushing on contact cement for the second holder. The blue masking tape works well, I should have thought of that before I did the first one. After the cement has dried, positioning the stack. I added the screwdriver as an additional spacer I could pull out to press the first end in place. I rolled this afterwards. 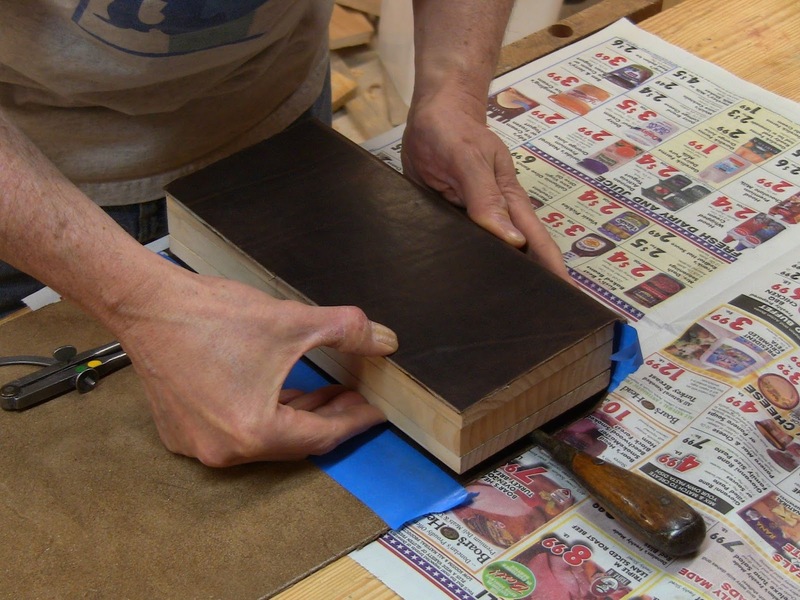 Spacing out the second side to figure out where to position the strop. I cemented it in place like the stone holders. 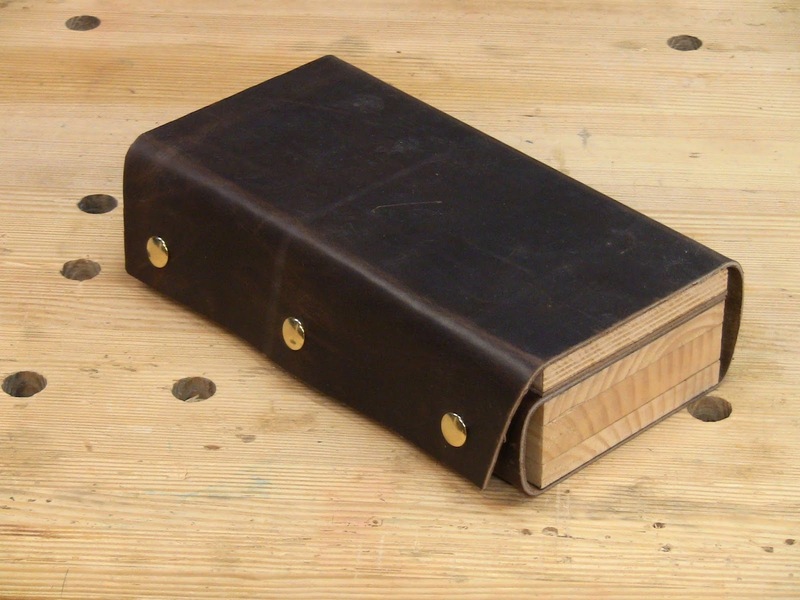 For the snaps, I used a hardware store snap kit and a leather punch. 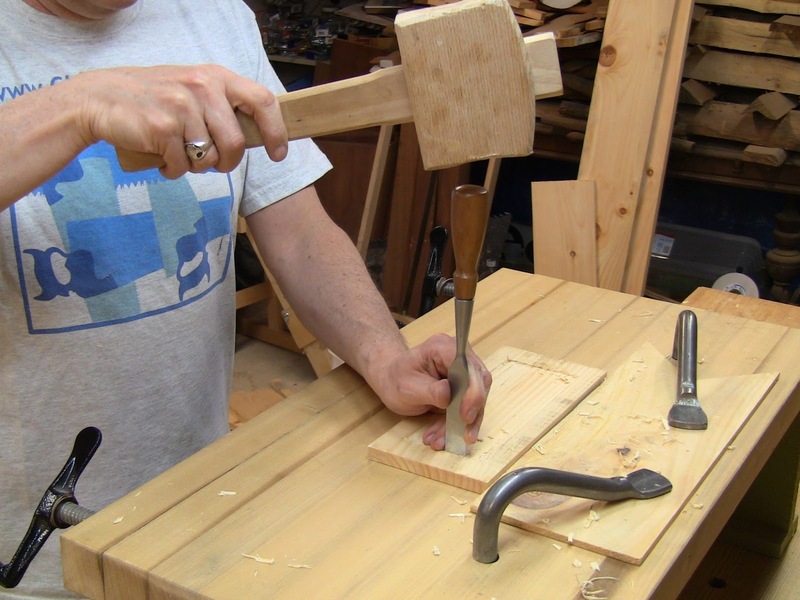 An awl makes a nice improvised punch. Punching holes for the snap bases. 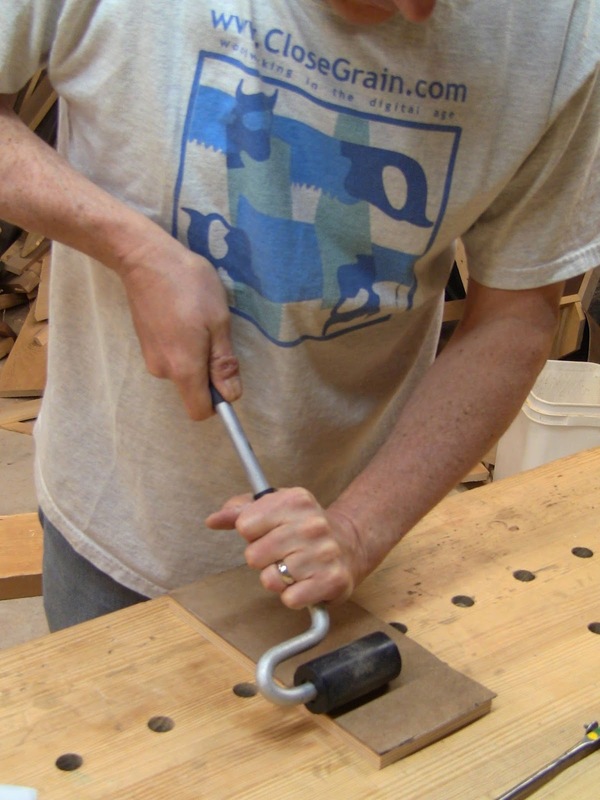 Using an awl to make the center hole, where the punch wouldn't reach. 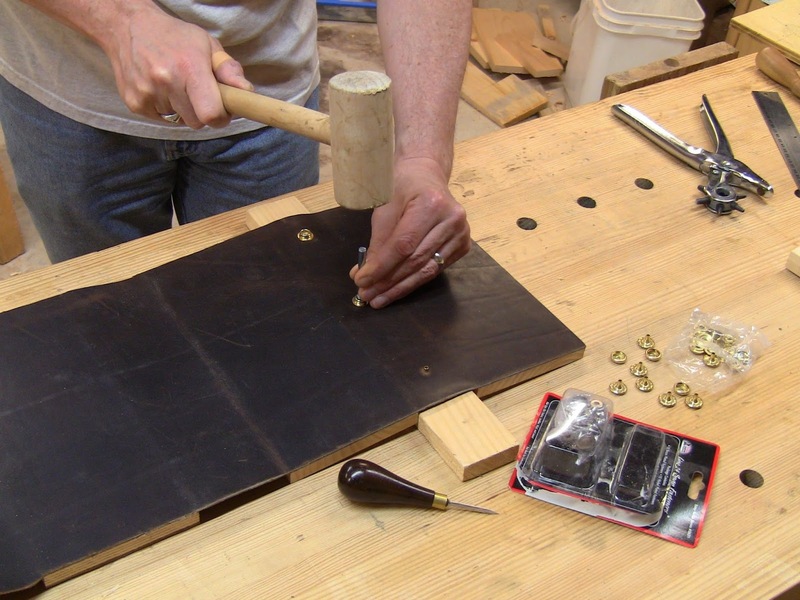 With the kit rolled up, tapping down with a mallet to mark where the snaps line up with the flap. The marks in the leather. Now that I know where the snaps will end up, laying out the flap. 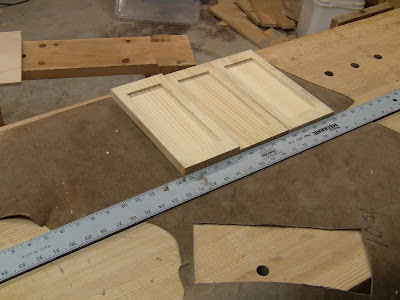 I made the flap end 3/4" past the centerline of the snaps. 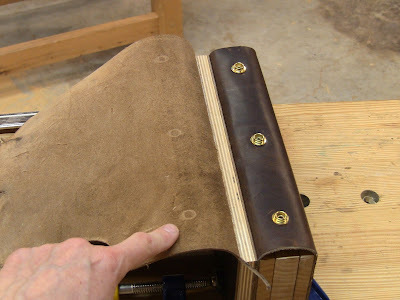 I cut the remaining leather off with the chisel, punched the holes and set the snap caps. 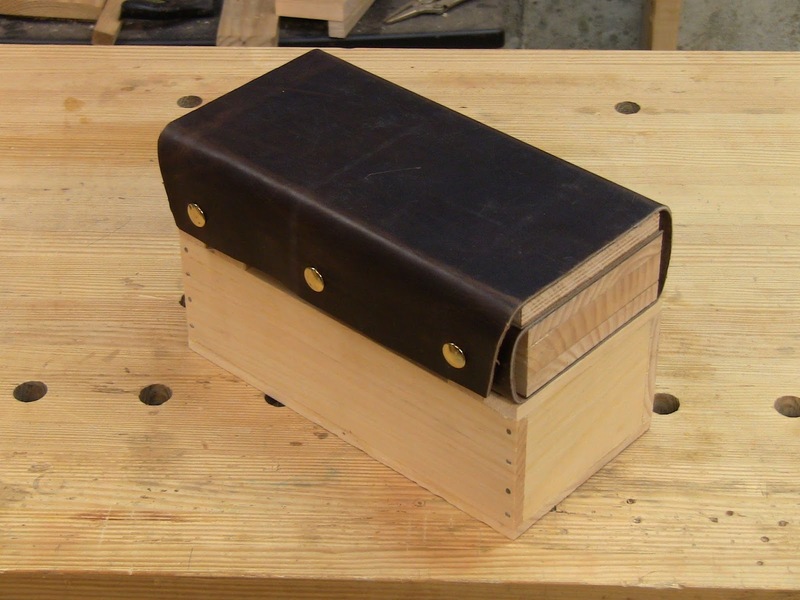 The completed kit sitting atop the matching miniature Japanese toolbox. The sharpening kit and miniature toolbox make a nice portable setup that can be tucked into a larger toolbox. Both fit nicely in the hands. I love this! I feel so inspired. I like this! Really like the wood cover for the stones. A neat way to prevent cross contamination. 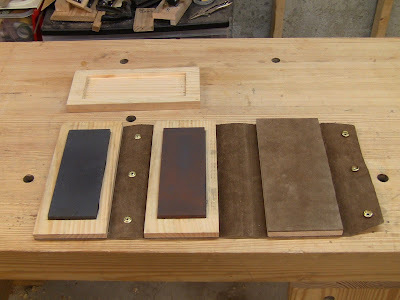 Have been looking for a way to store my diamond plates, and pastes. 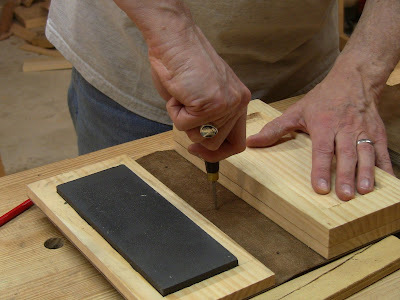 The original Veritas boxes and Tools from Japan stone tray are awkward. I use water so will probably go with a canvas wrap. Thanks!